High security integral cylinder pull protects the cylinder from being drilled. 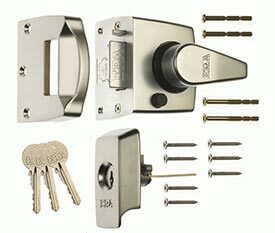 The British Standard Keyless Egress Nightlatch Door Lock is a high security door lock with a classic and robust design. This lock conforms to British Standard 8621:2007 which mirrors the BS 3621:2007 but for 'escape locks' and meets the tough criteria/requirements laid down by insurance companies and the police. 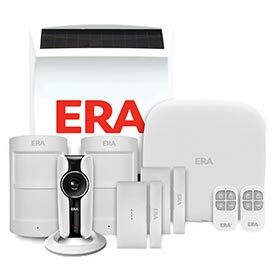 Locks meeting these requirements are classified as providing keyless egress at all times. This applies where there is a requirement for an easy action method of opening an external door from the inside with no need for keys or similar devices for unlocking. Especially relevant for entrance doors in multi-residential and other buildings. A keyless lever on the inside of the door ensures it is possible to make an emergency escape in an event of fire. Available in both 40mm and 60mm backset making it an ideal product to replace most existing front door locks and is ideally suited for panelled doors. The main bolt is "automatically" deadlocked into the striker, when the door is closed, preventing it from being retracted by a credit card. Designed with a 20mm bolt throw for even greater security and strength. A simple snib button enables the latch to be held in the withdrawn position (only), allowing the door to be accessible without operating the handle. 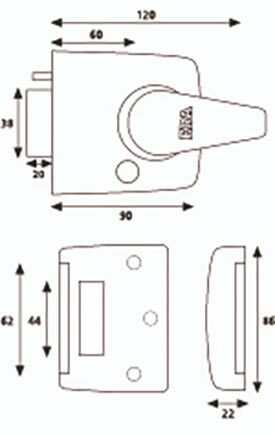 The British Standard Egress Nightlatch is a face fitted, non handed design enabling both left and right handed operation; and the striker is designed with a 3 hole fixing for additional strength and security. Suitable for inward opening interior and exterior timber doors only, the British Standard Nightlatch is available in brass effect, satin and a range of chrome effect finishes with matching brass effect and satin external cylinders. The external cylinder features a high security integral cylinder pull, which protects the cylinder from being drilled. 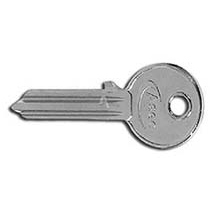 The cylinder has over 30.000 cut key variations and is supplied with 3 cut keys. Can be keyed to pass or master keyed to allow multiple doors to be accessed with the same key. All finishes meet the requirements of BS EN 1670:2007 Grade 3 (96 hours) for Corrosion Resistance to provide the most robust finish for your hardware.